On November 12, 1933, Hugh Gray took the first known photos of the Loch Ness Monster. Outside of maybe Bigfoot, Nessie (the Loch Ness Monster) is probably the most well-known cryptid in the English-speaking world. Claims of the existence of this monster date back possibly as far back as to Saint Columba (December 7, 521 A.D. – June 9, 597 A.D.). According to legend, Columba helped rescue a man from a water beast in Scotland. Of course, humans had not yet invented photographs and so it would not be for another nearly millennium and a half until “evidence” of the monster outside of eye-witness accounts would come about. To that end, Hugh Gray would achieve his place among the world’s most famous photographers of cryptids for his “encounter” on November 12, 1933. After attending church, he walked along Loch Ness, eventually noticing something strange happening in the water. He claims that a massive creature then emerged, prompting him to take pictures, only one of which actually showed “something” upon being developed. 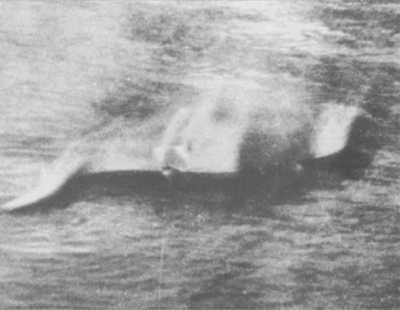 The famous photograph shows what appears to be an elongated creature surfacing, possibly splashing about, thereby blurring the image, with possible flippers also identifiable. On the right side of the photograph, perhaps you can see what might be a head versus a tail on the left side. Or maybe it just shows a dog carrying a stick in its mouth making its way in the water toward the cameraman. For better or worse, we have no definitive explanation of what is actually in that photograph, but it was only the beginning. Throughout the 1930s and even in the present decade, more photographs and videos would emerge purportedly depicting the so-called “monster”. During the past 80 years, others would search for Nessie using everything from sonar to submersibles and yet no irrefutable proof has yet materialized. Yet, we ask our readers, what do you think? Is the photograph of Hugh Gray depicting some kind of “monster”, a dog with a stick, or something else altogether? Please let us know in the comments below! Previous ArticleWorld War I did not really End on the Eleventh Hour of the Eleventh Day of the Eleventh Month…of 1918!